Surveys and detailed traffic studies are set to begin at five locations in Delhi to decide on sites for implementing pod cars as a para-transit mode of travel. Feasibility studies will be conducted at Dwarka, ITPO, Karol Bagh, East Delhi and North Campus, following which one or two areas will be selected for the pilot project. The Delhi government asked the Delhi Integrated Multi-modal Transit System (DIMTS), an autonomous government-funded body created for transport planning and solutions, to work on a detailed project report to assess the demand and feasibility of pod cars at the locations in the last week of April. The DIMTS has to complete the studies in six months and suggest locations for implementation. Pod cars, a form of personal rapid transit system to ferry commuters within a limited area, are being tested to supplement existing public transport modes like the Metro and buses. They will run on an elevated track, will be battery-operated and driver-less. The capacity of a pod will vary from four to seven passengers. The DIMTS will begin surveys in June and complete them in two months. The ‘origin-destination surveys’ will also indicate the type of technological solutions required and the travel pattern of commuters. Traffic counts will be done at intersections to check how many vehicles cross it per hour and in which direction. Finally, a ‘stated preference survey’ will question residents on their income profile and willingness to travel in such a mode of transport. Sources said the existing data compiled by RITES will be taken into consideration for a secondary analysis. The project is likely to be a public-private partnership. Once a business plan is made and approved by the government, it will be sent for tendering. Though the government had estimated that the cost of travel in pods will be Rs 6 per km, officials said the fare can be fixed once the cost and demand of the project is established. Pod cars are currently undergoing trials at the Heathrow Airport, where the project is expected to be commissioned this summer. The pod car project is also being worked out in Amritsar, and Haryana is also considering its implementation in Gurgaon. In Delhi, a similar project was evaluated for Vasant Kunj last year by the DIMTS, the detailed project report for it is still with the Delhi government for approval. Pod taxi: Capital’s new ride? The future is here and promises to be quicker and more personal. The Delhi government is looking at introducing ‘city pod cars’ to modernise its overburdened transport system. Pod cars are small automated taxis that run on a dedicated track and can seat two to 10 people. The personal rapid transit system was introduced in 1975 in Morgantown in West Virginia, US and is popular. At London’s Heathrow Airport and Masdar City in Abu Dhabi trials are on. Closer home, the Haryana government is doing a feasibility study for Gurgaon. With narrow elevated tracks and little space needed to raise pillars, pod cars are considered ideal for densely populated areas. Chief minister Sheila Dikshit has called for a study on running the pod cars in congested areas such as Karol Bagh, Delhi University’s North Campus and east Delhi. A kilometre of underground metro track costs R200 crore while the pod car system works to around R30 crore per km, a Delhi government official said. Delhi may soon become a city of most modern public transport system. 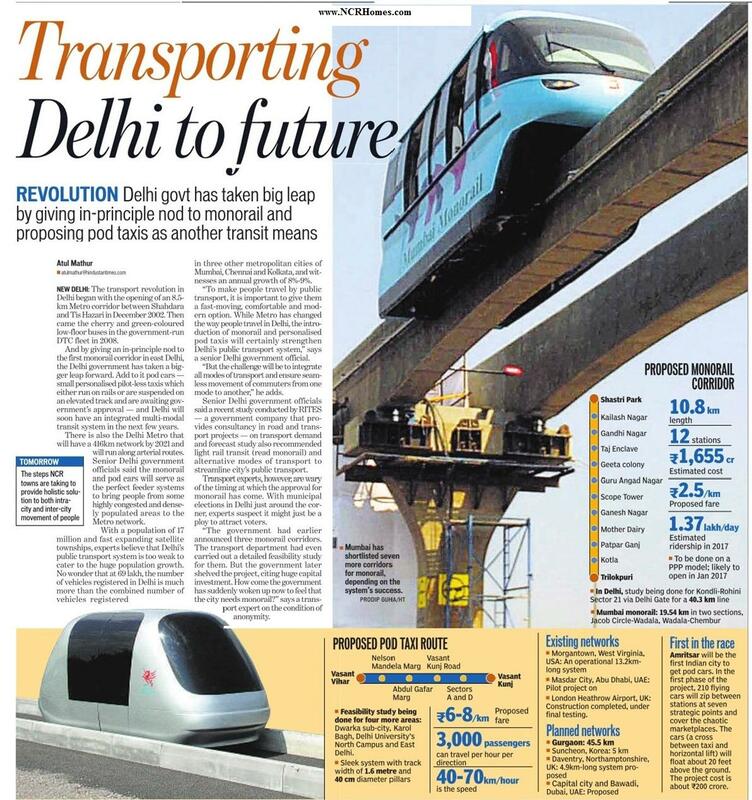 While the Metro has already changed the way people travel and monorail is being seriously considered for areas where the Metro cannot reach, Delhi government has now set its eyes on pod taxis. Following a presentation on this modern transport system by a private company, chief minister Sheila Dikshit has asked the transport department to get a detailed project report prepared on pod taxis. Dikshit said a pilot project can be launched in areas like Karol Bagh, North Campus, east Delhi, ITPO and Dwarka city where metro and monorail cannot be constructed. “We can extend it to other areas later if the pilot project proves successful,” Dikshit said. Interestingly, Delhi is not the first city in India to have been thinking of pod taxis. Haryana government has already started a feasibility study on developing a 105km network for pod taxis in Gurgaon. According to the presentation made to the city government, the pod taxi system can be commissioned in a limited place with poles of 40 cm diameter and an elevated track of 1.6 metre width. “The company has offered to commission the project with its own resources and the city government will not have to spend anything on it. It will be economically viable for commuters, too, as the average fare of the pod is likely to come around Rs 6 per km. The pod, with a capacity of seven passengers, will be battery powered,” a press statement issued by Dikshit read. “To maintain high frequency of taxis, the company has offered to operate a huge fleet of pod cars. The passengers will be able to board and de-board from the elevated stations on the route,” a Delhi government official said. Officials said pod taxis are an ideal system for congested areas and can easily serve as feeders for metro, monorail and BRT systems. In comparison to the Metro and Monorail, which are cost intensive projects, pod taxis are very economical. While the Metro costs R300 crore per kilometre and Monorail costs R170 crore for a kilometre, pod taxi network can be built for just R30 crore per kilometre. दिल्ली में भी दौड़ेगी मेट्रो की 'छोटी बहन' पॉड!